More than just a carefully researched and documented biography but also an insightful read about one of history’s charming and honest yet forgotten figures. Hannagan taught his colleagues that advertising, marketing, and public relations strategies were more than mere strategies. They only reached a market when the publicist learned how to humanize them. His publicity and marketing techniques were acclaimed as the ‘Hannagan Way.’ Steve Hannagan was a Midwestern kid of Irish descent who became one of the great publicists of his age? 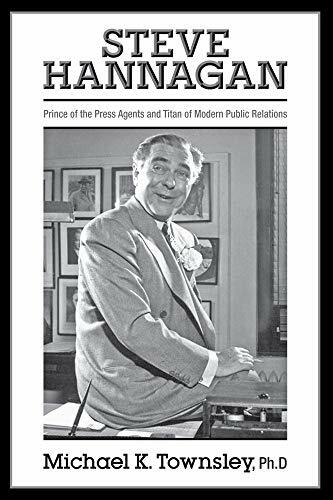 What better way to learn about Hannagan than in Dr. Michael K. Townsley’s biography, titled “Steve Hannagan: Prince of the Press Agents and Titan of Modern Public Relations” (Dog Ear; 2018. The book provides readers gripping tale of the life of one of history’s forgotten standouts. “Steve Hannagan” details the life of the PR pioneer; his youth, family, and Irish heritage played an important role in his gradual rise to power. However, it was his keen understanding of stories that appealed to editors and readers, creativity, work ethic, devotion to truth, and, above all, charisma that cemented his legacy as an enduring figure who developed, tested, and refined many of the press and publicity principles commonly used today. News professionals, PR agents, and even students of journalism, advertising, and marketing could take a leaf from Hannagan’s book. His integrity and charisma opened doors to opportunities and success. His success did not only earn him a steady stream of business to his firm but also the friendship of the who’s who of the day. He even dealt with the notorious like the gangster Al Capone whose presence in Miami Beach frightened many local residents who feared that he would compromise their safety and drive down property values. “Steve Hannagan” does more than just narrate the life and times of the man who often straddled the fine line between journalism and sensationalism and maximized the full potential of press and publicity. In addition, the biography explores factors and stages that led to his success – something that should be of greater interest to the book’s intended readers. Hannagan was also more than a grey suited press agent, he was also known as the romantic partner of two famous Hollywood stars – Gloria Swanson and Ann Sheridan. Hannagan a power broker who shaped the history – and the world – of marketing, public relations, and business. Watch out for the public display of the book at the upcoming Miami Book Fair on November 16 to 18, 2018 at Miami Dade College. Dr. Michael Townsley’s career dealt with studying, managing, and developing financial tools for colleges and universities. He was the senior vice president for finance, marketing, and administration at Wilmington University in Delaware After leaving Wilmington University, Dr. Townsley was named professor of business at Becker College in Massachusetts. Later, he was named dean of the Business Program. Dr. Townsley has authored Financial Strategy for Higher Education, Weathering Turbulent Times, and Small College Guide to Financial Health: Beating the Odds, Financial Strategy for Higher Education. In addition, he has contributed chapters and numerous articles on finance, management, IT systems for financial management, and higher education marketing. Dr. Townsley holds a PhD from the University of Pennsylvania, a Master of Arts from the University of Delaware, and a Bachelor of Arts from Purdue University.